​​​​ LAKEWAY – Belmont Village Lakeway is rising along N FM 620 at 107 Bella Montagna Circle, just south of Lexus of Lakeway. The 130,000-sf four-level tiered facility will have 156 private apartments for independent living, assisted-living and memory care. ​Belmont Village is spread over ten acres with a third of the property to be left as impervious cover. The community ​​is slated to open summer 2018. 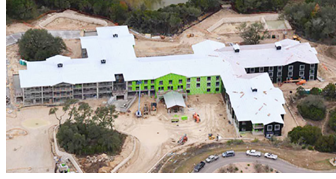 The facility will contribute to the 1,198 units of senior housing that is planned or existing in the Lakeway area.